I bought the cat book at Northshire Books when I was in Manchester, Vermont because it was 20% off the cover price. The dog and cat books are also carried by Whimsies. 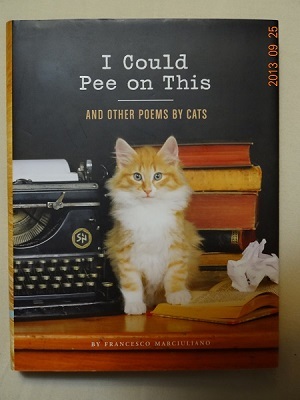 Like most poetry, some are better than others. The ones that are funny are really funny. 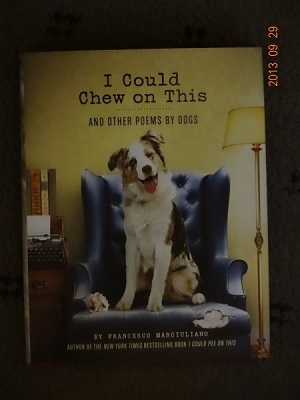 The full-color photos of the dogs and cats that accompany the poems are adorable, with many complementing the poems quite well. With dog titles like Unleashed (“I’m free! … I’m lost! ), Splash (a dog that keeps chasing stones as you skip them across the water–and he cannot stop), and Time (a dog wondering where you are, and not to leave him again), I laughed quite a lot. Some cat titles are Cold (everything at the vet’s is cold–except the puddle of urine on the vet’s notes), Why are You Screaming (a cat trying to figure out why you don’t like the present–a dead mouse on your bed), Something’s Wrong (a cat realizes that the walls are a different color, the place is laid out wrong … all since he got out of the carrier, and he intends to find out what happened), and Nine Lives (what each one is for, including writing ones’s memoirs), were a lot of fun. This is for cat and dog lovers, or for anyone who likes animals.